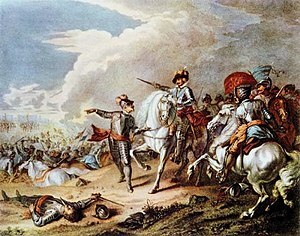 The victory of the Parliamentarian New Model Airmy ower the Ryalist Airmy at the Battle o Naseby on 14 Juin 1645 merked the decisive turnin pynt in the Inglis Ceevil War. The Inglis Ceevil War (1642–1651) wis a series o airmed conflicts an poleetical machinations atween Pairlamentarians ("Roondheids") an Ryalists ("Cavaliers") in the Kinrick o Ingland ower, principally, the manner o its government. This page wis last eeditit on 8 October 2015, at 19:32.